Pack your joie de vivre in a bag and make your way to Italy for a Chianti wine tour. 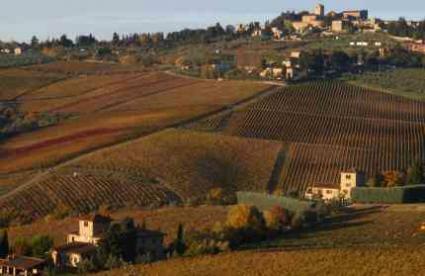 Nothing beats Chianti country to bring your Italian soul out of the closet and plaster an ear-to-ear smile on your face. It's Italy's quintessential wine region that is shamelessly flush in hedonistic temptations. It's in Tuscany (Toscano) in Northern Italy in an area that stretches between Florence (Firenzie) down to Siena (Siena). Chianti wine country is an inspiring chunk of Italy to visit that is a sing-song aria of picture book hilltop towns, bucolic hills and valleys of vineyards and olive groves lined with wavering Italian cypress. It's a renaissance atmosphere with relics, history, romance, earthy but cosmopolitan Italians, cuisine that is simple and gastronomical art, wrapped together with a warming air that beckons all. By the way, did I mention there is wine? There are many reasons to visit Italy, taking a tour through Tuscany and touring and hanging out in Chianti country is one of the best ones. As a general statement about Chianti, it is a tangy dry red wine with bright cherry and raspberry fruit and spices that can be lean to supple and complex. The quality and character varies for these Sangiovese-based wines. Part of the reason stems from the composition of the Chianti region. There are eight designated zones for Chianti and differences in these sub-regions influence the wine's outcome. Of these the heart and soul is Chianti Classico, the historical center for Chianti and widely acknowledged for the best renditions of Italy's best known wine. The Classico region is always indicated on a bottle of Chianti by a black rooster emblem (Gallo Nero) on the neck that symbolizes the Classico producers. Non-Classico Chiantis will always reference their particular region. Don't hesitate to try these other non-Classico wines, producers all adhere to the same Chianti formula rules and there are many excellent wines to be drunk and wineries to visit. Most people go to Tuscany and create an action-packed itinerary of places and things to do. Yes, you must go to Florence (Firenze) and see the Uffizi Museum, check out the Statue of David, and then climb to the top of the Duomo for a 360° view of this wondrous city. Of course, don't miss leaning with the Tower of Pisa or going to Siena to check out the Romanesque architecture and maybe place a bet on the Palio. Do all that, do more than that, but don't skip your Chianti wine tour. There are many ways to approach your wine tour, a quick one day drive through the hilltowns south of Florence, stop at a few wineries, have a picnic al fresco in the country, then head back to town. That would be good but it would only give you a quick taste of Italian wine country living. Better yet, plan for a minimum five day visit and set-up headquarters in Siena or any of the countryside towns in Chianti country that dot the landscape and make for quick getaways to the corners of Tuscany. I would advise against staying within Florence itself since getting in and out of the Renaissance city will burn up lots of touring time and the incessant whine of two-cycle scooter will drive any tourist to drink-which, if anything else will motivate a tourist to escape to find some Chianti. So, visit the city, just don't stay there. Do your research, read your guidebooks, browse the internet, talk to friends. Imagine the places in Tuscany you want to see, the Italian bites you want to consume, the art you want to see (or buy), the Italian movies you want to reenact, where you want to sing your version of Volare, the cuisine that makes you salivate and above all else, the wines and wineries you want to visit in Chianti country. When traveling, there's always something that goes wrong. The best way to deal with that is be flexible and go with the flow. When planning your trip you need to decide whether to go solo on your self-directed Chianti wine tour or to hook-up with a tour. You can make arrangements in the U.S. with an agency to take over the entire trip for you but that allows for minimal flexibility, the tour is in charge, you're not. Alternatively, a hybrid trip that is self-directed combined with an occasional planned tour can make for an enriching experience. Traveling al solo can be a rewarding experience that allows tourists to spread their wings and do whatever they want and whenever. However, often the individual travelers miss out if they adhere strictly to their personal self-discovery tenets and don't take advantage of local resources. A local inhabitant can open up new discoveries an individual can never uncover. Recommendation? Determine where you want to set up shop, list the places to see, things to do, foods to eat and the wineries to visit. When appropriate use local tour services to visit wineries or other sites, they save getting lost in the incoherent maze of roads and highways in the region and they let you drink as much Chianti as you want without the carabiniere getting involved and re-directing your destination. Forget hotels and pensiones, rent your own villa and pretend you are Italian. Throughout the region you can find apartments and villas in the country. It is not as easy as staying at a four-star hotel with room service but it gives you a chance to be Italian. There are many websites and agents that will find a property that rents for a few days, weeks, or months. Also, many wineries have rooms or villas available for guests, check them out. Chianti is a great food wine. It has bright alluring fruit and a tang of acidity for balance that makes it a no-brainer companion to the food, especially local Tuscan cuisine that often raises the chicken-egg conundrum, "Which came first? The pollo all diavolo or the Chianti? A great idea that has grown in popularity is to do a cooking-wine tasting trip. This combines a few days at a villa or restaurant learning how to cook Tuscan fare and then visit local wineries or wine bars to learn about the regional wines. It's a can't miss proposition. Not all wineries are open to the public, some allow visitors but by appointment only. It is highly recommended to verify if a winery will welcome your presence and make a reservation to visit. You will find the Italians welcoming and happy to discuss their wine with you. Also take note that many of the hilltowns throughout Chiantis will have a local tasting hole-in-the-wall where they offer tastings and sales of local wineries and cooperative wines. Keep an eye out. There are plenty to visit, not all open to the public. Remember to check ahead and make appointments or expect to be disappointed. Below are links for wine directories, Italian wine importers with links back to Chianti wineries and Chianti wineries.